Arsenal have made a bid for Olympiacos star Roberto Jimenez, but have seen it rejected according to the Metro. The Greek side want the Gunners to pay the 29-year-old’s £4.3 million release clause, but it is unknown whether they are willing to do so. 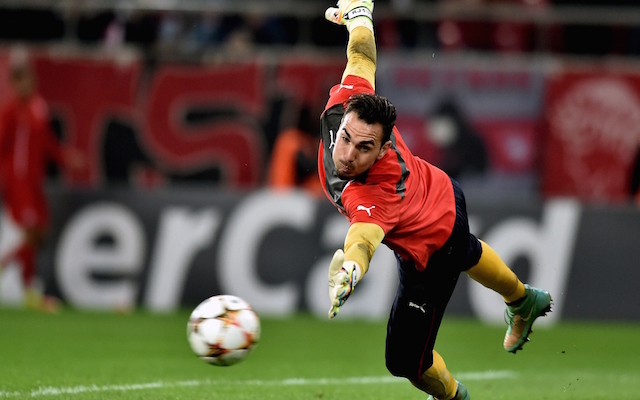 The goalkeeper was a regular for Olympiacos last season, making 40 appearances in all competitions. However, if he does go to the Emirates Stadium then he will be second choice behind the recently signed Petr Cech. Arsene Wenger is interested in the Spaniard as a potential replacement for David Ospina, who may still leave the club as he wants first team football. This Colombian could follow Wojciech Szczesny out of the club. The Poland international joined AS Roma on loan earlier in the transfer window, after the arrival of Cech from Chelsea. Arsenal are unlikely to end their transfer business there, with their defeat to West Ham on the opening weekend of the campaign showing some significant holes in their squad. If they are going to challenge Chelsea and Manchester City for the Premier League title, then they will surely have to strengthen up front and bring more depth in elsewhere. Ten Ultimate Football Journeymen, Including Ex-Arsenal, Liverpool & Man United Stars Plus Brazil Legend With 15 Clubs!